Halfords Yuasa Racing’s weekend was one of mixed fortunes at Snetterton Circuit for Rounds 16, 17 and 18 of the Dunlop MSA British Touring Car Championship on the series' long-awaited return after the summer break. Reigning champion Gordon Shedden, recovered from a tricky qualifying session on Saturday to take victory in the final race, ensuring he left Norfolk on a high – retaining his position at the head of the Drivers’ tally and with a glint in his eye as he heads for home turf at Knockhill in two weeks' time, 12-13 August. Triple champion Neal brought home a podium finish in the opener but contact from behind meant a potential fourth spot in the finale was taken from his grasp. The second half of the season began in earnest on Saturday with a topsy-turvy qualifying session for the Honda duo. Neal was relieved to retain his berth on the second row of the grid after his quickest time temporarily seemed in jeopardy while stewards investigated a possible ride height infringement. Meanwhile, Shedden found himself 21st on the grid, contending with the maximum 75kgs of success ballast – placed on board his Honda Civic Type R due to his status as championship leader – around a circuit where carrying the added weight really does make itself known. Coupled to a lack of clear laps in the busy session, it conspired to create an uphill battle ahead if he was to maintain his grip on the standings lead. The first race of the day, Round 16, saw the two factory Honda Civic Type R drivers with the bit between their teeth. Neal charged onto the rostrum, taking third on the fifth lap and holding his position until the chequered flag, while Shedden had an action-packed 12 laps culminating in 13th spot and more points for the title cause. This meant the Scot would have no ballast on board for race two, and he still held his championship lead. 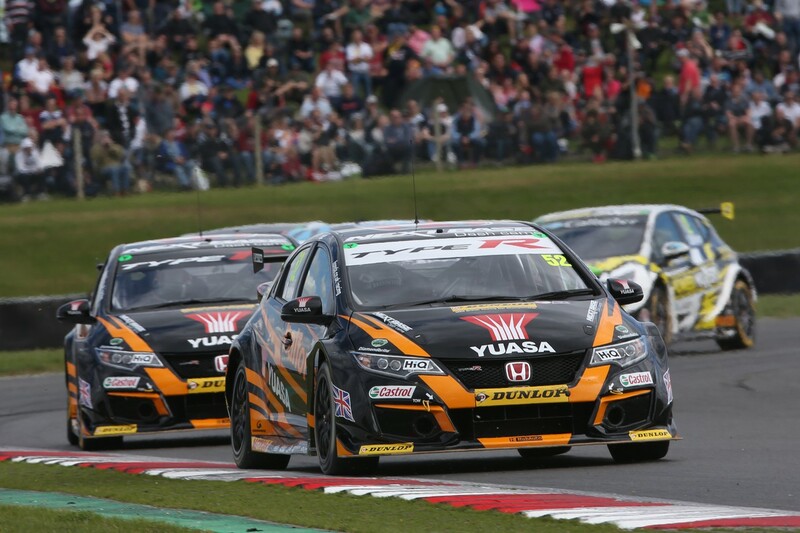 Shedden, also a triple BTCC champion, gained further ground in Round 17 – fighting through to seventh spot, while Neal secured a top ten finish and another points haul. With Flash landing second place on the reverse grid draw for Sunday's final encounter, the opportunity for a race victory to round the weekend off in the best possible fashion was there for the taking. Neal started brightly and was hunting down fourth position until contact from behind put pay to his race on lap four. Shedden, though, was able to take advantage of a little slice of luck after mechanical problems for Andrew Jordan up ahead meant the door was open for a third victory of the campaign, which he duly took – much to his, and the team's delight. Gordon: "With my poor qualifying position, I knew that this weekend would be about damage limitation and trying to gain as many points as possible, so I fought hard in races one and two and got the luck of the reverse draw to put me second for the final race. I just kept plugging away and towards the end the tyres were going off, but as soon as (Andrew) Jordan pulled over it was head down and elbows out to finish on top of the podium which I never expected at the beginning of the day – I'm ecstatic. I'm back in the lead of the championship and heading to my home circuit at Knockhill next. It's always mega there as the crowd are right behind me and give me that extra tenth of a second." Matt: "After being reinstated in qualifying I thought it would be a tough day from there onwards, so I was over the moon to get another podium finish. In the second race the car felt strong but I got shuffled down the order and then struggled to regain places. In the third race I was climbing up the order and again the car felt good, but I was tagged from behind and that was race over for me which was really frustrating. But onwards and upwards to Scotland now in two weeks!"